Kick Butts Day is a national day of activism that empowers youth to stand out, speak up and seize control against Big Tobacco. The day is organized by the Campaign for Tobacco-Free Kids and was first held in 1996. 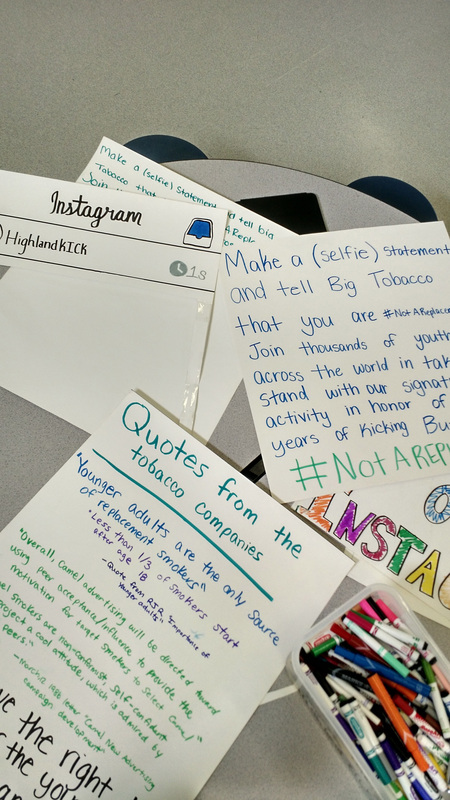 The KICK (Keep It Clean Kids) anti-tobacco group at the Highland Community School District near Riverside is celebrating Kick Butts Day with their very own #NotAReplacement Instagram photo booth. Students at the Highland Middle and High Schools are invited to make a selfie statement using the photo booth and then posting their photo on social media. We encourage everyone to participate in this year’s 20th Anniversary of Kick Butts Day making a selfie statement with #KickButtsDay or #NotAReplacement. Then, share your photos on the KBD 2015 Instagram feed, or share your selfies on Flickr, Twitter, Pinterest and Facebook! Tobacco marketing is less prominent in the United States today because of restrictions imposed by federal laws and the 1998 legal settlement between the tobacco companies and the states. The tobacco industry has also been shamed into retiring Joe Camel and the Marlboro Man, the notorious marketing icons that lured kids for so long. Slick ads in magazines with large youth readerships, flavored tobacco products, cigars, smokeless tobacco and e-cigarettes. It’s no surprise that tobacco companies continue to target kids because their business model depends on it: They know that 90 percent of adult smokers start at or before age 18. Numerous internal tobacco industry documents, revealed in lawsuits against the industry, show that the tobacco companies have long perceived adolescents as a key market, studied their smoking behavior and developed products and marketing campaigns aimed at them.